Short Lederhosen Corbi3 in Havana. The Lederhose Corbi3 in havana brown are Lederhosen that fall just above the knee in the style of shorts, rather than the traditional knee-length Lederhosen, so are perfect for keeping cool in the hot summer season. The Corbi3 are made from 100 percent suede leather in an attractive shade of light-brown that is reminiscent of a Cuban cigar. The Cordi3 Lederhose also come with a high-quality leather belt, featuring a sturdy silver buckle engraved with the Stockerpoint antlers. 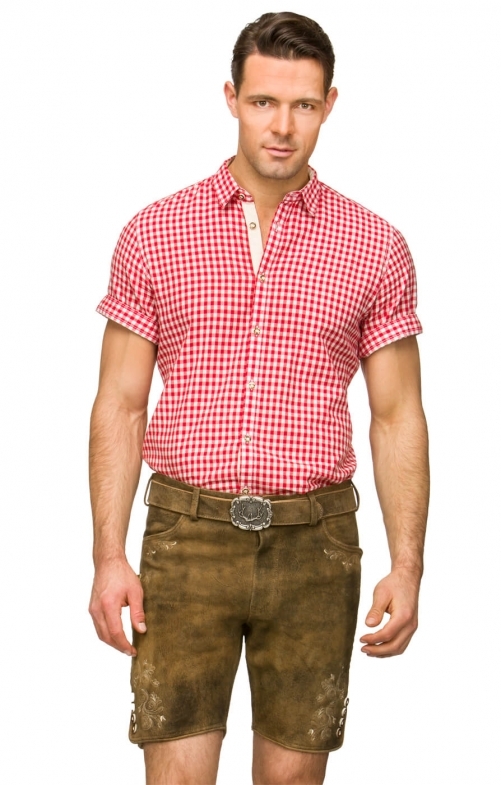 Wear with a T-shirt or a smart Trachten cotton shirt for a look that is the height of classic Bavarian chic.